The uplifting entrepreneurial story of Anicom’s Nobuaki Komori is for anyone who has ever felt overwhelmed by challenges and struggles and is keen to develop the capacity to rebuild forward. One of our society’s deepest secret is that many of the most successful entrepreneurs suffer misfortunes from time to time. Struggles and sufferings do not fit our theory about what it takes to succeed in life and so we fail to conceded that pain is inevitable in our lives. Your pain and tears will wash away the illusion of what you once believe to be true. We aim to stand on the firmer ground of experience hard won through hearing and distilling the essence of the stories of our H.E.R.O. in overcoming their struggles who opened their hearts to us that resilience is an art that can be learned to light up our soul to accept and burn away the darkness and emerge from the experience transformed. When taking a pet to a hospital, you have anxiety that you do not know how much money you need. Nobuaki Komori is the founder of Anicom Holdings, the largest online-to-offline pet insurance company in Japan commanding a 57.7% domestic share of the growing pet insurance market with over 699,000 policies in force generating sticky recurring revenue income & cashflow and with tie-ups with over half of all, or 6,200, animal hospitals nationwide to reduce the financial burden of the owner for treatment, and to help the veterinarian provide the best medical care. Japanese households own 18.4m pets and only 1.5m or 8% were insured vs 25% of the 15m pets were insured in UK. 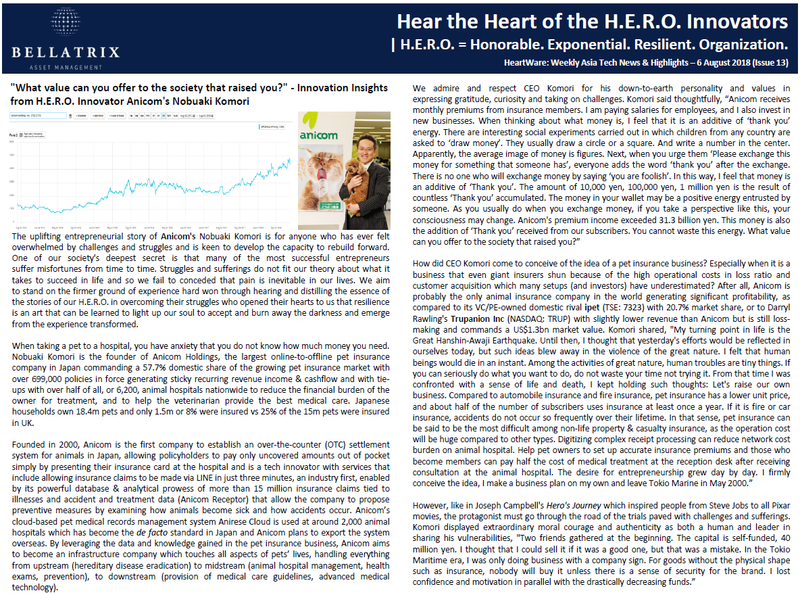 Founded in 2000, Anicom is the first company to establish an over-the-counter (OTC) settlement system for animals in Japan, allowing policyholders to pay only uncovered amounts out of pocket simply by presenting their insurance card at the hospital and is a tech innovator with services that include allowing insurance claims to be made via LINE in just three minutes, an industry first, enabled by its powerful database & analytical prowess of more than 15 million insurance claims tied to illnesses and accident and treatment data (Anicom Receptor) that allow the company to propose preventive measures by examining how animals become sick and how accidents occur. Anicom’s cloud-based pet medical records management system Anirese Cloud is used at around 2,000 animal hospitals which has become the de facto standard in Japan and Anicom plans to export the system overseas. By leveraging the data and knowledge gained in the pet insurance business, Anicom aims to become an infrastructure company which touches all aspects of pets’ lives, handling everything from upstream (hereditary disease eradication) to midstream (animal hospital management, health exams, prevention), to downstream (provision of medical care guidelines, advanced medical technology). How did Komori overcome the grave challenges at that time? Komori shared, “Initially, I was confident about the pet insurance system that I designed and developed and I did not notice that the system did not have enough ‘heart’. I saw insurance as mechanical. However, pet owners do not consider pets as things but as a member of the family. We redefined the insurance system again after ‘anthropology-ing’ the pet. We thought that we should review everything up to the expression of fine words. We revised advertisement expressions and document descriptions all at once to clarify the company’s attitude. As we continued to explain each item with integrity and sincerity, it turned out that the pet owners who empathized with us gradually joined the insurance system of Anicom and became a strong partner. The pet owner also asked animal hospitals to request that they respond to Anicom. The results began to appear, and partner animals hospitals and members gradually increased. And in April 2001, an article with the headline ‘New pet insurance appears!’ was posted on national newspapers and acceleration is added to the growth speed. In July 2001, a major pet chain shop offered to partner with us to sell their pets with an animal health insurance attached. From this point, the number of members began to grow sharply and Anicom climb to become the industry’s largest. Without the cooperation of many people, the business cannot be continued. (2) Takahiro Arimoto 有本隆浩, founder & CEO of Matching Service Japan エムエス ジャパ (TSE: 6539, market cap US$385m), the online recruitment platform leader in the specialized fields of certified public accountants, tax accountants, financial professionals, lawyers and experienced professionals in the ‘management department’ that include personnel affairs, general corporate affairs and business planning. It is also involved in the provision of M&A brokering services to companies and accounting firms. J-ing (www.j-ing.com) is the search site of accounting and law offices, and tax accountants; J-ing Concierge is for specialized organizations that include accounting offices; KAIKEI FAN (www.kaikeinet.com) is a career change and industry trends portal site for certified public accountants, legal affairs, lawyers, and law office job search; LEGAL NET (www.legalnet-ms.jp) is a change job information site. Due to its focus in these specialized areas with higher barriers to entry, MS-Japan enjoys significantly higher operating profit margin (37.6%) that most online recruitment portals. MS-Japan launched the innovative Manegy online communication and information platform (www.manegy.com) in Mar 2017 for these professionals in the specialized fields which now has over 100,000 registered users. MS-Japan was founded in 1990 by Takahiro Arimoto and is headquartered in Tokyo. We now live in an exponential world, and as the Baupost chief and super value investor Seth Klarman warns, disruption is accelerating “exponentially” and value investing has evolved. The paradigm shift to avoid the cheap-gets-cheaper “value traps” investment mistakes, to keep staying curious & humble, and to keep learning & adapting, has never been more critical for value investors. We believe tech-focused innovators with non-linear exponential growth potential are the most relevant multi-year investment trend and opportunity. There is a structural break in data in the market’s multi-year appraisal of the type of business models, the “exponential innovators”, that can compete and thrive in an exponential world. Yet we do not want to chase the highly popular megacap tech stocks, or fall for the “Next-Big-Thing” trap by overpaying for “growth”, or by chasing to invest in fads, me-too imitators, or even in seemingly cutting-edge technologies without the ability to monetize and generate recurring revenue with a sustainable and scalable business model, and we want to know how to distinguish between the true innovators and the swarming imitators. We see a distinct opportunity in under-the-radar Asian SMID-cap tech stocks with unique scalable business models run by high-integrity entrepreneurs with a higher purpose in solving high-value problems. H.E.R.O. stands for “Honorable. Exponential. Resilient. Organization.” and is operationalized into a unique, systematic 4-step investment process to separate the winners and losers. The H.E.R.O. HeartWare Weekly highlights interesting tech news and listed Asian emerging tech innovators with unique and scalable wide-moat business models to keep yourself well-informed about disruptive forces and innovation, new technologies and new business models coming up, and the companies that ride on and benefit from them in some of the most promising areas of the economy in Asia as part of our thought leadership for our ARCHEA Asia HERO Innovators Fund to add value to our clients and the community. Hope you find the weekly report to be useful and insightful. Please give us your candid feedback and harshest criticisms so that we can improve further to serve you better. Besides the BATTSS (Baidu, Alibaba, Tencent, TSMC, Softbank, Samsung), do also tell us which Asian tech entrepreneurs & CEOs whom you admire and respect and why – we will endeavor to do up profiles of them for sharing with the community. Thank you very much and have a beautiful week ahead. Thank you so much to everyone who had participated in our presentation at the BrightTALK webinar “Finding Value in Asia: Discovering Tech Innovators in an Exponential World” on 12 July. We had received positive feedback from the participants who include institutional investors, professional & individual investors and lifelong learners in value investing, including comments on our Catapult analytical framework to complement and rejuvenate the economic moat analysis to view the value creation process afresh and continually discover innovators creating, enabling and capturing new demand (vs exploiting existing demand) with exponential non-linear growth potential and value creation. The Catapult exponential projectile of the 4Cs are systematic observations and leading-indicator questions you can ask to analyze and assess the business models of exponential innovators. We are encouraged to persevere in our efforts to build a warm community of resilience, learning and exponential growth where entrepreneurs and investors support and encourage one another to navigate and thrive in this challenging exponential world and we are grateful to have your support. Download the presentation slides: http://www.heroinnovator.com/wp-content/uploads/2018/07/BrightTALK-HERO_Finding-Value-In-Asia_12-July-2018.pdf. We look forward to open up a meaningful conversation with you to explore the H.E.R.O.’s journey together. Based on requests from institutional and professional investors, we include the printer-friendly PDF version of our archive of past H.E.R.O. HeartWare issues. Alternatively, you can download them on our website: http://www.heroinnovator.com/heartware. Thank you so much for reading and giving us your feedback.